For a while Google has offered a service where you can send it a URL and get back a chart. It seems all good ideas at Google get squashed so this will only be guaranteed to be available until April 2015. But until then it can be a quick/easy way to get a chart into a SQL Developer User Defined Report using the PL/SQL DBMS_OUTPUT type. SQL Developer has a few simple charts and gauges available already but this API can give you ability to create Line, Bar, Pie Charts, Map, Scatter, Venn Diagrams, Radar Charts, QR Codes and Meters. Build a url and submit it as an IMG tag in your web page. Google will generate a PNG image and return it as a response to the http image request. 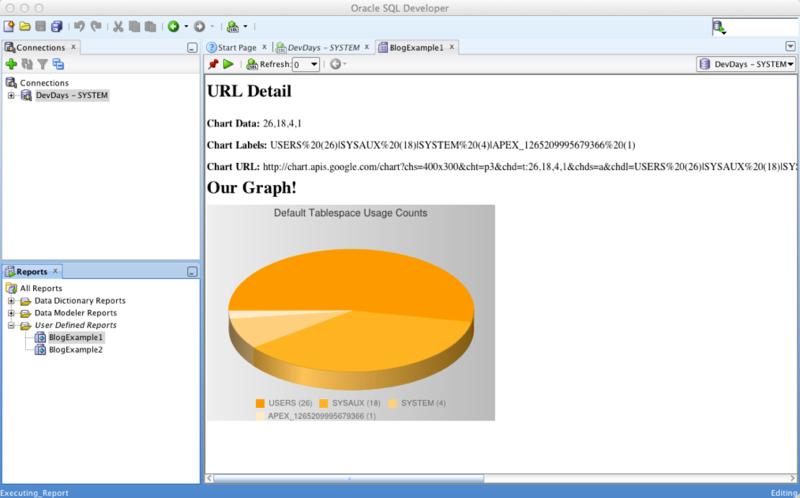 Your SQL Developer installation must be able to hit the chart.googleapis.com URL so internet access is required when you generate your report. Pretty cool huh? It is an easy way to dress up your boring lists of facts and figures, and free to boot. So how do we use this in PL/SQL? Well if we're outputting HTML in a PL/SQL User Defined Report, we just have to take some time to build the URL. Here is some code to do something silly, but it will illustrate the point. We are going to create a pie graph to show the percentage of users that are using each tablespace as default. I am using my handy Developer Days VM as a source.